After a jury convicted him of attempted premeditated murder in violation of California Penal Code §§ 164 & 189, and he was sentenced to “an indeterminate life term with the possibility of parole, plus a 13–year determinate term”, Lawrence Hoagland appealed. People v. Hoagland, 2013 WL 5636474 (California Court of Appeals 2013). On appeal, he argued that the jury’s verdict “was based on speculation.” People v. Hoagland, supra. September 23, 2010, Connie Hoagland was severely injured when a pipe bomb inside her truck exploded as she turned on the ignition. . . . At the time . . . [Lawrence] and Connie had been married for 25 years. They were living in the family home with their two adult daughters, their high-school-age son, and their three-year-old grandson. In the months before the crime, [Lawrence] and Connie were experiencing serious financial problems, and in early 2010 they filed for bankruptcy. During this time period, their relationship was `distant.’ Connie suspected [he] was having an affair, but when she confronted him about this he assured her he was committed to their relationship. On the morning of September 8, 2010, Connie drove [him] to the airport for a flight to Pennsylvania for a purported business trip. That evening, as she was driving home in her truck from an errand, she had to take a detour because the street she had driven on en route to her errand was blocked off, and there were police and fire personnel there. The police had evacuated the area after several individuals observed a pipe bomb in the street. 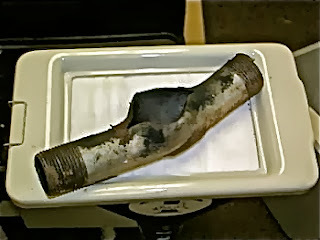 The bomb consisted of a pipe affixed to a piece of cardboard in a Federal Express envelope with a cell phone attached. Before the police arrived, bystanders on the street saw cars drive over the bomb. When the police viewed the bomb, the envelope was `roughed up,’ and an alligator clip apparently used in the bomb was lying in the street. The police rendered the bomb safe with a robot, and determined [it] was designed to explode when a person called the cell phone attached to the bomb. There were pieces of duct tape with loose ends on the bomb. After the September 23 bomb explosion in Connie's truck, authorities examined the exterior underside of her truck and found what appeared to be a duct tape residue mark in the area of the driver's side floorboard. under the steering column of her truck. She meant to tell [Lawrence] about it, but the wire was later gone and she forgot about it. On the morning of the [23rd], Connie again noticed a wire hanging from the steering column when she got in the truck with her son, and asked her son to remind her to tell [Lawrence] about it. When she arrived at work that morning, she locked the truck with the remote `chirper’ device. At the end of her day shortly after 4:00 p.m., [Lawrence] called her and said he would be home at 5:30 p.m. Connie perceived this call as odd because she usually had to call him to ask if she should eat dinner without him. When Connie went out to her truck, she pressed the remote device to unlock it. She noticed the truck appeared to be unlocked already because the device did not make the sound it typically makes at unlocking. Connie was the primary driver of the truck, but [Lawrence] had access to an extra truck key and he occasionally drove [it]. When Connie started the ignition, the pipe bomb in her vehicle exploded. Connie felt `excruciating pain’ in her feet and legs. A bystander helped her out of the truck and called 911.
extensive injuries to her feet and lower legs, including serious lacerations, tissue avulsions, and exposed bones. She underwent numerous surgeries and was unable to walk for a substantial period of time. At the time of trial about one and one-half years later, she had extensive scarring; a rod in her foot and one in her tibia; permanent nerve damage to her foot; and toes that did not bend. Also, her hearing was affected. . . .
September 8 pipe bomb found in his neighborhood and the September 23 pipe bomb that exploded in his wife's truck. An AT & T cell phone attached to the September 8 bomb (the `bomb phone’) showed that on September 7 between 8:36 and 9:44 p.m. there were 18 incoming missed calls from a Verizon cell phone (the `calling phone’). Both the bomb phone and the calling phone were prepaid phones for which there was no subscriber record. The calling phone was activated on September 5 and the bomb phone was activated on September 6. In [Lawrence’s] wallet, police found a paper from AT & T setting forth the phone number for the bomb phone, and a paper from Verizon setting forth the phone number for the calling phone. The September 7 phone calls from the calling phone to the bomb phone were transmitted via Verizon and AT & T cell phone towers located about two to five blocks from [his] place of business. Also, at about 9:00 p.m. on September 7, [Lawrence] made a call from his personal AT & T cell phone, and the call was transmitted from the same AT & T cell phone tower near his work. included alligator clips among its components. The authorities contacted numerous stores in San Diego County to determine whether they carried the type of alligator clips found among the exploded bomb debris, and the only store that sold them was Fry's Electronics. [Lawrence’s] bank records showed that on September 21 . . . he purchased several items with his debit card at Fry's Electronics. Fry's Electronics records showed that about one minute before [his] debit card purchase, a person paid cash for alligator clips from the same cashier at the same cash register. browser history on their business computer and discovered that on the morning of September 3 there were 22 searches for YouTube videos related to building pipe bombs, including a cell phone activated bomb. Coit and [Lawrence] were the only persons who used this computer. Lawrence and Connie had an insurance policy that would pay him $300,000 on her death. People v. Hoagland, supra. At the time of the bombing, they had “about $75,000 in credit card debt” plus “their mortgage debt was about $100,000 higher than the value of the house.” People v. Hoagland, supra. After the bombing, Coit discovered that their business “owed about $40,000 in back taxes.” People v. Hoagland, supra. affair with someone in Pennsylvania because [he] made numerous trips there; started having long, private cell phone conversations while at work; and Coit saw on the business's computer an e-mail indicating [he] was looking for work in Pennsylvania and an e-mail with a picture of Rupert and her children at the beach. “Lee Ann Rupert,” the Pennsylvania woman with whom Lawrence was having an affair, testified for the prosecution at his trial. People v. Hoagland, supra. She said they have been having an affair “since 2007”, but there was “`a lot of stress’” in their relationship in the summer of 2010 because another man was interested in her and she doubted he was sincere about leaving his wife and marrying her. People v. Hoagland, supra. When he was with her in Pennsylvania September 8-17, he had a job interview. People v. Hoagland, supra. He texted her after returning to California, and on September 22 sent a message that said, in part, “’”Now things are moving faster and picking up speed. . . . The start of the life I have wanted and needed and waited for is very real.”’” People v. Hoagland, supra. bomb-making websites on his and Coit's business computer on the morning of September 3; denied he called the cell phone numbers on the papers in his wallet; and denied he had anything to do with the pipe bombs. He claimed the cell phone numbers were given to him by a transient named Jerry who, with [Lawrence’s] permission, had parked his motor home behind the photography studio in exchange for guarding the studio at night. When [he] spoke with Jerry and asked him to `watch out for the place,’ Jerry gave [Lawrence] the two cell phone numbers, one belonging to Jerry and the other to Jerry's wife. [Lawrence] admitted that on September 21 he purchased alligator clips from Fry's Electronics using cash. He claimed he was going to use [them] to construct a static electricity ground while installing memory on a work computer, and used cash with the plan to reimburse himself from his business's petty cash fund. [He] also admitted that on the night of September 3 he did Internet searches on his home iPad related to making bombs. He claimed he did this after watching a television show called “’Burn Notice’” because he wanted to look up if something on the show was actually feasible. The Court of Appeals began its analysis of Lawrence’s argument by noting that in “reviewing a challenge to the sufficiency of the evidence, we examine the entire record in the light most favorable to the judgment to determine whether there is substantial evidence from which a reasonable trier of fact could find the defendant guilty beyond a reasonable doubt.” People v. Hoagland, supra. [his] business computer and his personal iPad were used to conduct numerous Internet searches related to bomb making and denotation. [Lawrence’s] wallet contained the phone numbers for both the calling phone and the bomb phone that were associated with the September 8 bomb found in the street in [his] neighborhood. There were repeated calls from the calling phone to the bomb phone on the evening of September 7 from an area of town located near [his] business. [Lawrence] used his personal phone to make a call from this same area during the same one-hour period as the calls from the calling phone. [He] left for Pennsylvania the following morning (September 8), and the pipe bomb was found that night on a street that shortly before had been traversed by the victim when driving in her neighborhood en route to an errand. On September 21, [Lawrence] went to Fry's Electronics and used cash to purchase alligator clips. Alligator clips of the same type and sold locally only by Fry's Electronics were found in the debris of the September 23 bomb that exploded in Connie's truck. trying to arrange his financial and personal affairs so he could leave his wife and move to Pennsylvania to be with Rupert. Rupert was pressuring him to complete this process; at one point she questioned whether he could financially afford to make the change; and she had suggested they end their relationship. [Lawrence] insisted to Rupert he could arrange his affairs in California and move to Pennsylvania, and he had at his disposal a $300,000 life insurance policy payable to him if his wife died. desperate for money and freedom from his marriage so he could be with Rupert; he was afraid of losing Rupert because of the repeated delays in his efforts to extricate himself from his family obligations; and in September 2010 he devised a plan to kill his wife, collect the insurance money, and achieve his goal of moving to Pennsylvania. The evidence tying [him] to the two bombs was strong. Numerous Internet searches on bomb making were found on his computers. Of particularly compelling significance, he was found in possession of the cell phone numbers uniquely associated with the September 8 bomb. The calls associated with these cell phones were made the night before [he] left town to visit his girlfriend, from a location near [his] place of business, and close in time and location to a call made from [Lawrence’s] personal cell phone. The jury could reasonably deduce that [he] attached the September 8 bomb to the underside of his wife's truck, arranged to detonate it with the cell phones, and then left town with the intent of having an alibi upon its explosion. Further, after [he] failed in his efforts with respect to the September 8 bomb, he continued with his plan by planting the September 23 bomb. Buttressing this conclusion, two days before the September 23 bomb exploded, [he] made a cash purchase of a component used in this second bomb. The court therefore affirmed Lawrence’s conviction and sentence. People v. Hoagland, supra. The news story you can find here provides more details about the case and includes photos of Connie, Lawrence and Coit.